study of the Malay voicing contrasts with a focus on acoustic measures. Waveform and spectrogram samples ... Palato-. Alveolar. Palatal Velar. Glottal. Plosives. p b. t d. k g nasals m n Å. Affricates. t dÊ. Fricatives Î¸ Ã°. word-formation in bilingual dictionaries often discussed in lexicographic studies. .... criteria such as register, genre, domain, time of publication, and size, are .... However, a small number of free grammatical morphemes (and to a lesser extent, . Word order - Test - Answers. A - Form ... 8) Victoria Station / leaves / the bus / at 7 o'clock ... also correct: At 7 o'clock the bus leaves Victoria Station.__. We shall only give examples to illustrate how they function. a boy .... inflected in the formation of comparative and superlative degrees. ... and adjectives, otherwise known as content words or full morphemes, rather than the grammatical. By learning mathematics in French instead of English, students in ..... report choosing English books more frequently than French books by 7th grade (3.66 vs .
English translation of the French version as delivered. UNHCR's oral intervention at the European Court of Human Rights. Hearing of the case of I.M. v. France. 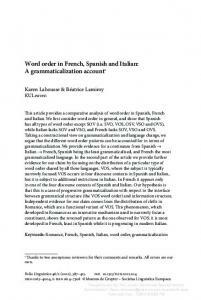 Word order in English and French The position of English and French adverbial connectors of contrast English Text Construction 8(1): 88-124. Drawing upon the theoretical framework of Systemic Functional Linguistics, this paper compares the word order patterns of English and French adverbial connectors of contrast in a comparable bilingual corpus of quality newspaper editorials. The study shows that the two languages offer the same possibilities in terms of connector positioning but differ markedly in the preferred patterns that they display. In both languages, connector placement proves to be influenced by three main types of factors: language-specific syntactic, rhetorical and lexical factors. The notion of Rheme, which tends to be under-researched in the literature in comparison to that of Theme, plays a key role in the analysis. sentence-medial positions, especially within the verb phrase. The third objective will be to assess the importance of the role played by the lexical component in connector placement. A number of studies have noted that some individual connectors have their own positional preferences (Jacobson 1964; Rubattel 1982; Altenberg 2006). However, the recognition of the potential importance of the lexical component is still fairly marginal in the literature and the respective roles played by lexical factors on the one hand and system-related patterns of placement on the other remain unclear. 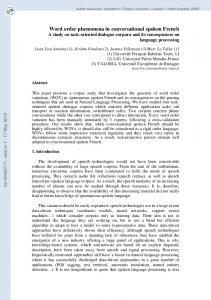 The framework adopted in this study is that of Systemic Functional Linguistics (SFL). SFL provides a particularly well-suited apparatus to account for connector placement choices. Previous studies (Altenberg 1998, 2006; Lenker 2011) have demonstrated that such choices are closely related to the notions of Theme and Rheme, as well as Given and New information. The theoretical framework of SFL will be combined with the powerful methods and solid empirical basis afforded by corpus linguistics, as advocated in Thompson and Hunston (2006). The two approaches share numerous properties which make their combination extremely promising, such as their concern for authentic language and the importance that they attach to corpus frequencies for language theorization (Halliday 2006). SFL and corpus linguistics are in fact complementary: SFL contributes a theoretical grounding often lacking in corpus linguistics, while corpus linguistics provides a solid and stylistically-varied empirical foundation together with powerful methods of extraction and analysis. In spite of the many arguments in favour of a synergy, very few large-scale studies have yet combined the potentialities of SFL with those of corpus linguistics. The present study situates itself in a set of recent studies attempting to bridge the gap between the two approaches (see Thompson and Hunston 2006; Kunz and Steiner 2013). The focus of the present study will be on the meaning relation of contrast, defined as a broad semantic category subsuming several more precise relations (i.e. adversative, replacive and concessive), which have in common that they imply a negation of either similarity or implication between two events or pieces of information. This study, focused on adverbial connectors of contrast (such as however, nevertheless in English and cependant, néanmoins in French), forms part of a broader research project comparing the use of cohesive markers of contrast in English and in French. In that study, not only adverbial connectors but also conjunctions of coordination (but, mais), conjunctions of subordination (e.g. although, bien que), and a set of multi-word cohesive devices (or cohesive lexical bundles) expressing contrast (e.g. it remains that, in spite of the fact that, il n’en reste pas moins que) are taken into account. This paper is made up of seven major subparts. Section 2 introduces the notions of Theme and Rheme. Section 3 presents the data and the methodology used for the corpus-based analysis. Section 4 describes the five main positions identified for adverbial connectors. The results are discussed in Sections 5 to 7; Section 5 focuses on the quantitative differences between English and French as regards connector positioning; Section 6 investigates the various discursive effects achieved by connector placement; finally, Section 7 discusses the part played by the lexical factor in the positioning of adverbials connectors. Section 8 provides some concluding remarks. 2. Theme and Rheme in Systemic Functional Linguistics The present study strays from common practice in research on adverb placement in that, instead of resorting to purely syntactic criteria (as in Greenbaum 1969; Quirk et al. 1985; Altenberg 2006; Hasselgård 2010; Lenker 2011), its descriptions and analyses are fully grounded in the SFL framework, relying on the core notions of Theme and Rheme. The elements that have a function in transitivity are: subjects, objects, verbs, complements and adjuncts. Except for a number of special themeless structures, see Halliday and Matthiessen (2004: 98-100). ^ means “followed by”; Halliday and Matthiessen 2004), which once again highlights the strong link that exists between adverbial connectors and the initial position. has recruited 130 organisations to the cause. believes his faith should never be imposed on others. Another important distinction in SFL is the one between marked and unmarked Theme. Because the Theme is invariably located at the beginning of the sentence, in declarative sentences the topical Theme typically coincides with the grammatical subject of the clause. When this is the case, as in examples (1) and (2) above, the Theme is said to be unmarked. By contrast, when the thematic position is occupied by another constituent than the subject (typically a fronted adverbial), as in (3), the Theme is considered marked, and the subject is relegated to the rhematic part of the clause. It should be noted that a group of researchers advocate setting a fixed Theme boundary after the grammatical subject, irrespective of whether it is preceded by a marked Theme (e.g. Downing 1991; Altenberg 1998; Caffarel 2006). In the present study, Halliday and Matthiessen’s (2004) approach, according to which the Theme includes only the first topical element of the clause, will be favoured. Whitehall recruited 20,000 new civil servants. It is striking that, while the notion of Theme has been covered extensively in the literature, the Rheme remains severely understudied within SFL research. This may stem from the fact that the Rheme is usually defined by exclusion, as everything that is not part of the Theme, or as what remains once the Theme has been identified. As explained above, the literature provides detailed accounts of the structure of the Theme, distinguishing between its several subparts (i.e. textual, interpersonal, topical). By contrast, distinctions within the Rheme are sorely lacking in current SFL research. This may seem surprising, as in many cases the Rheme makes up a substantially larger part of the clause than the Theme, and is typically the host of the focus of the message. To my knowledge, two researchers provide a slightly more detailed account of the structure of the Rheme. Fries’s (1994) notion of N-Rheme, on the one hand, refers to the last constituent of the clause, which constitutes “the newsworthy part of the clause, that is, the part of the clause the writer wants the reader to remember” (ibid. 234). Example (4a) is part of a fund-raising letter which urges the reader to contribute money to a project designed to measure how large cities handle the stress resulting from population growth. The N-Rheme is in italics. By placing this segment in the N-Rheme, the writer chose to lay emphasis on the effects of the decisions on the potential donor. The writer could have decided to lay stress on a different aspect, such as the frequency of the phenomenon at hand (i.e. every day), by organizing the information differently, as in (4b) (Fries 1994: 244). (4) (a) Every day decisions are being made by local officials in our communities that could drastically affect the quality of our lives (Fries 1994: 243). (b) Decisions that could drastically affect the quality of our lives are being made by local officials in our communities every day (ibid. 244). French researchers Morel and Danon-Boileau (1998), on the other hand, have coined the term post-rheme (“post-rhème”) to refer to an optional intonational constituent consisting of a group of syllables produced with a flat intonation, a low pitch and a reduced intensity at the end of an oral paragraph. Semantically, the post-rheme may either (and only) express epistemic modality (e.g. He’ll be late, I think) or consist in a nominal argument, co-referent with a pronoun preceding it in the sentence (ibid. 28) (e.g. He’s nice, Paul). In the same way as few researchers have identified different subparts within the Rheme, few researchers have paid attention to phenomena of markedness at the rhematic level. One exception to this rule is Taglicht (1984), who complements the notion of marked Theme with that of marked Rheme. Taglicht (1984: 20) defines the marked Rheme as an element that is “detach[ed] from the element or elements with which it is contiguous in the unmarked sequence” and placed sentence-finally. The marked Rheme may take three different forms: “(i) an end-shifted subject” (Taglicht 1984: 23), as in (5); “(ii) an end-shifted constituent of the predicate” (ibid. ), as in (6); or “(iii) a final item separated by a ‘partition’3 from the item that would precede it if it were part of the unmarked rheme” (ibid.). This partition may take the form of a connector, as in (7). See Section 6 for a definition and discussion of partitions. In fact, so far the literature has tended to concentrate exclusively on the periphery of the thematic structure (see N-Rheme, post-rheme), leaving more internal elements to be the poor relative of thematic structure.4 Nevertheless, distinctions within the Rheme are crucial for whomever wishes to account for variation in adverbial connector placement and for the motivations behind this variation. As a result, in the classification designed for this study a number of distinctions will be made within the Rheme, whenever it proves relevant for the analysis (see Section 4). 3. Data and methodology The study was carried out on the basis of a comparable corpus of quality newspaper editorials. The corpus contains 744,185 words of French editorials and 988,651 words of British and American English editorials.5 Irrespective of the language they are written in, newspaper editorials share not only the same medium, but also a combined informative and argumentative purpose. This ensures maximum text-type comparability, which is particularly important when comparing word order phenomena across languages (see for example Virtanen 1992; Hasselgård 2010 on the placement of adjunct adverbials across several English genres). Some distinctions made with respect to the Theme are also relevant for the Rheme. 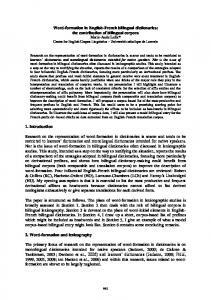 This is the case of Hannay and Gómez González’s (2013) “thematic parentheticals”, i.e. “parenthetical elements, irrespective of form, which are marked off typographically and occur immediately after, and are triggered by, a thematic element” (ibid. 99). Because those parentheticals are triggered or “anchored” by the preceding thematic element (ibid. 103), Hannay and Gómez González consider them to be thematic. However, strictly speaking they are part of the Rheme, as they occur after the topical Theme. 5 Most of the data comes from the Mult-Ed (Multilingual Editorial) comparable corpus of British English and French editorials, compiled at the Centre for English Corpus Linguistics, Université catholique de Louvain (http://www.uclouvain.be/en-cecl-multed.html). In addition to Mult-Ed, the corpus includes data from American newspapers. The analysis is based on a search list of 28 English and 35 French adverbial connectors, listed in Table 1.6 The occurrences of these connectors were extracted from the corpus using WordSmith Tools 6 (Scott 2012). They were subsequently disambiguated manually in context, so as to weed out any irrelevant uses. Thus, the occurrences in which the item was not used as an adverbial connector (as in example (8), where though is used as a conjunction of subordination) or was not used with a contrastive meaning (as in example (9), where still has a temporal meaning) were discarded. Connectors used below clause level, as in example (10), were also disregarded. In total, the disambiguated set (i.e. the set of the occurrences that were kept) makes up no more than 40.3% of the whole data set. (8) Though some tuna is farmed, the Worldwide Fund for Nature has warned that many are wild fish that have been penned while they fatten. (9) More than three years into his presidency, he still looks uneasy in many of his public appearances; he still lacks the grace and charm of a Ronald Reagan that would disarm critics. (10) Pour le référendum sur Maastricht, M. Chirac, pourtant trés [sic.] eurosceptique, avait bien compris qu’en vue de sa nouvelle candidature à l’élection présidentielle de 1995, il n’avait pas d’autre choix que le “oui”. The list was designed by pooling lists of adverbial connectors collected from various English and French reference books (Quirk et al. 1985; Chalker 1996; Knott 1996 and Liu 2008 for English; Grieve 1996 and Roze et al. 2012 for French). The list obtained was then supplemented by means of Dyvik’s (1998) corpus-driven method. See Dupont (2013) for details on the design of the list. 7 English yet and French or are on the borderline between conjunctions of coordination and adverbial connectors (see for example Quirk et al. 1985: 927; Biber et al. 1999: 80; Cosme 2007). While some of their features, such as their fixed position in the clause, make them resemble coordinators, in other respects they are more like adverbial connectors. For example, unlike conjunctions of coordination, they may not link subordinate clauses (see Cosme 2007: 240-242). Because they do not meet all the criteria required to qualify as conjunctions of coordination, yet and or are usually considered as adverbial connectors. However, because they behave like conjunctions of coordination rather than adverbial connectors in terms of their position in the clause (i.e. they are restricted to clause-initial position), they will not be included in my corpus analysis of adverbial connector placement. by Le Draoulec and Bras (2006), who demonstrate that the initial position is a necessary condition for alors to acquire the status of connector; Patpong (2006), who highlights that depending on its function (i.e. continuative or conjunctive), the Thai conjunction kɔ: occupies different positions in the clause; or De Cesare (2010), who identifies position as one of the determining factors of the textual functions fulfilled by the Italian adverbs anche, proprio and soprattutto. These observations also provide some evidence in support of the largely documented privileged link between adverbial connectors and initial position, also in languages other than English and French. (11) Citizens of the European Union had already been among the victims of attacks […]. The EU responded swiftly: Terrorist assets were frozen, and airline and maritime security were tightened, as were immigration and visa policies. Terrorist cells were exposed all over Europe, and planned attacks were thwarted. At the same time, Madrid destroys any lingering illusions some Europeans may have had that Europe would be safe from terrorism. (12) For many evangelicals, you cannot be good and holy if you do not at the same time condemn gays to a life without love. (13) In short, if trade is used as a lever to promote a revolution in international labor rights, the lever will break. Still, the unions are pursuing a good cause, and the administration should agree to consider their petition. (14) The brutal truth, nonetheless, is that if every player had been in the prime of health and the captain presented with a double-headed coin in advance of each Test, England would still have been in deep trouble. relative corpus frequencies. The occurrences of these connectors were classified into five categories according to their position, as described in the next section. The raw frequencies are provided in Appendix 1.
hypotactically related clauses” (ibid.). In these units, only one Theme is identified for the whole clause complex. This means that, if a subclause occurs in front of the independent clause, as in example (15), it will be taken to be the (marked) Theme of the whole clause complex. In some cases, however, instead of relating one clause complex to another clause complex, the adverbial connector was used to relate a subordinate clause to its superordinate clause, as in (16). In such examples, the scope of the connector is on the subclause only. Therefore, the most meaningful analysis was to classify the connector according to its position in the subclause, instead of the clause complex. (15) The move to abolish compulsory retirement at 65 is sensible, if late in coming, and in line with the great rise in life expectancy of recent decades. If people are to take full advantage of the more generous pensions for those who stay at work after 65, however, some profound changes in attitude will be needed. 9 (16) As governor he vowed to veto any tax increase sent to him by the legislature, talking instead about cutting the budget. The adverbial connectors are in bold in all the examples from the present article. Any other items relevant to the discussion of a given example have been underlined. beginning of elliptical clauses, such as (20), were also classified as thematic 1.10 When used in thematic 1 position, adverbial connectors perform the function of textual Theme. (17) Since the hearing is taking place during a presidential campaign, it’s unlikely that a spirit of bipartisan decorum will prevail. Nevertheless, it’s good to bring this debate out in the open. (18) Le chaos, que l’on redoutait de voir s’installer après la mort du fondateur du mouvement national palestinien, ne s’est pas produit. Au contraire, les Palestiniens ont fait la démonstration de leur sens des responsabilités. (19) Yesterday’s feeble performance by Donald Anderson, the supposedly independent chair of the foreign affairs committee, added to the gloom. But nonetheless the game of trying to make the prime minister admit what he may not feel is probably fruitless. (20) She should not have tried to suppress the story, but instead have gone on the programme to explain there was not much new. were also treated as interpersonal Themes. Examples (21) to (23) illustrate the thematic 2 position. (21) Crucially, though, the US was able to maintain the support of other countries. (22) It is dismaying that, even so, federal inspectors continue to catalog such shocking mistakes. (23) Il est vrai cependant que ces drogues peuvent, en atténuant la douleur, hâter la mort. The rhematic 1 category includes adverbial connectors occurring between the topical Theme, whether marked or unmarked,12 and the verb phrase of the clause or clause complex.13 Examples (24) and (25) below provide an illustration of rhematic 1 connectors used after an unmarked Theme. In examples (26) and (27), the rhematic 1 connector occurs after a marked topical Theme. This category also includes the few cases of connectors placed within the Theme itself. In most of these instances, the connector was used within a subclause used as Theme of the clause complex, as in (28). Connectors occurring after a viewpoint subjunct (Quirk et al. 1985: 568), as in (29), were also included in the rhematic 1 category. Note that, according to Taglicht (1984: 20), when the Theme is followed by a connector it is considered as marked by default, in compliance with his definition of marked as “characterized by the […] detachment of a syntactic element from the element or elements with which it is contiguous in the unmarked sequence” (ibid.). In other words, for Taglicht, whenever an initial element is detached from the rest of the sentence, it is a marked Theme. 13 The rhematic 1 position roughly corresponds to what Lenker (2011) refers to as “post-initial position”, which she opposes to the “genuine medial position” (akin to my rhematic 2 position, see below). Rhematic 1 connectors also partly overlap with Hannay and Gómez González’s (2013) thematic parentheticals (see footnote 4 for a definition). (26) When the surplus evaporated and turned into a huge deficit, however, Bush did not reverse his arguments. (27) Le matin, devant les principaux chefs militaires français, il a confirmé la perspective d’une guerre avec l’Irak en demandant aux militaires de “se tenir prêts à toutes éventualités” […]. L’après-midi, en revanche, devant les représentants du corps diplomatique, il a réaffirmé que “l’éventuelle décision d’utiliser la force doit être explicite et être prise par le Conseil de sécurité des Nations unies sur la base d’un rapport motivé des inspecteurs”. (28) When, however, the newspapers published stories wrongly claiming that British bases in Cyprus were at risk from Saddam’s weapons of mass destruction, no one in the Government did anything whatever to correct them. (29) Ironically, the decision to allow France to carry on spending was the right one economically. France’s economy is stagnating; it may be about to move into actual recession (two successive quarters of negative growth). To have raised taxes or to have cut public spending when French unemployment is almost 10% might well have pushed the economy into an even more serious recession. […] Politically, however, that is not the point. The rhematic 2 position encompasses all the syntactic slots available within the verb phrase of the clause or clause complex (i.e. the predicate along with all its obligatory complements). It is therefore a fairly broad category that includes connectors occurring within the predicate, as in (30) and (31); between the verb and its complement(s), as in (32) and (33); or, more rarely, within the complement, as in (34). This category also includes connectors used after an imperative verb, following Taglicht’s (1984) view of imperative clauses as themeless. Finally, the rhematic 2 category contains connectors used after the verb of a subjectless non-finite clause, also considered themeless clauses14 (see Halliday and Matthiessen 2004: 100; Cummings 2009: 47), as in (35). This was only relevant when confronted with cases where the scope of the connector was not on the clause complex, but solely on the subclause (see above). (30) President Bush would, though, be content to let regional powers contain and constrain the North Korean leadership if they were willing to do so. (31) Jacques Chirac a tenu, hier, à marquer l’événement. Il n’a cependant pas ouvert de piste pour l’avenir. (32) It is a matter of debate as to whether some of them would still be permissible under the Human Rights Act. They were, nonetheless, effective. (33) La formule “s’occuper de la mort d’autrui avant la mienne” ne fait pas l’éloge du sacrifice. Elle signifie plutôt que notre socialité n’est pas fondée sur la somme de nos égoïsmes. (34) The Prime Minister cannot be completely confident, however, that this reasoned approach will pay dividends on his preferred timetable. (35) We have consistently called on the Government to seek alternatives to conflict with Iraq, and we will continue to do so, urging instead that Britain maintains a policy of deterrence and containment. Finally, rhematic 3 adverbial connectors are placed after all the obligatory elements of the clause or clause complex. In some cases, as in (36) and (37), this position is akin to Morel and Danon-Boileau’s (1998) post-rheme. However, many rhematic 3 connectors are followed by one or several optional constituents, as in (38) and (39). In such cases, they do not fulfil the necessary conditions to qualify as postrhemes. (36) Mr Straw played down the significance of the achievement. He should not be so modest. There are important caveats, nevertheless. (37) Sans doute un autre scrutin, impliquant en ses régionales montagnes le néo-verdâtre Valéry Giscard d’Estaing, nous fit-il oublier les urnes du Quai Conti. Un pape en sortit, pourtant. (38) There, 16 years after writing Ohio State’s favorite cardio-rehab music, he died anyway at 63 of asthma. (39) Le week-end passait, cependant, sans que rien ne vienne étayer le couplage fantasmatique de ceci et de cela. Table 3 provides a summary of the classification presented in this section. For each position, one prototypical example is provided in each language. le problème n’est pas insoluble. that they must do both these things. farmers, by contrast, receive nothing. emplois-jeunes, en revanche, constitue une faute grave et contre-productive. consequent “cuts” in public services. a plutôt été la règle. be little defence against the demented ideology of Osama bin Laden. But it is something that ought to be attempted anyway. 5. Adverbial connector placement in English and French Once the occurrences of each adverbial connector had been classified according to their position, the percentage of use of each position was computed for each connector, and subsequently for each language, balancing the results so as not to give more importance to the very frequent connectors.15 The overall results for each language are presented in Table 4 below, with the raw total figures between brackets. This was done by adding up, for each position, the percentage of use of each connector in this specific position, and subsequently dividing the number obtained by the number of connectors investigated. The raw frequencies are provided in Appendix 2. While I am well aware of the difference between initial and thematic, it will be considered here that Halliday and Matthiessen’s (2004) claim mostly pertains to the initial or thematic 1 position, in view of their assertion that multiple Themes are typically structured as textual Theme ^ interpersonal Theme ^ topical Theme. continuum going from what is very frequent to what is infrequent in one language as compared to the other. The differences in frequency observed in Table 4 may be accounted for by an important difference between English and French in terms of adverb placement, which gives rise to many difficulties amongst learner populations. As Osborne (2008) explains, French and English differ with respect to verb-raising: French, as a verbraising language, typically places adverbs after the verb, as in (40); in non-verb-raising English, by contrast, adverbs are normally placed before the verb, as in (41). With this in mind, the larger proportion of pre-verbal adverbial connectors in English, along with the preference of French for the rhematic 2 position, appear motivated, at least partly, by syntactic differences between the two languages. Despite the fact that the five positions are allowed by each language system, syntactic factors of another order explain why one or several options are preferred over the others for the placement of connectors in English and in French. Chuquet and Paillard’s claim could have led us to expect a majority of connectors to be located at clause periphery in English, while French would tend to have a preference for the rhematic 1 and 2 slots (i.e. the two positions in which connectors are used parenthetically). These assumptions are only partly confirmed by our results. While our data shows that connectors are more frequently inserted within the verb phrase in French than in English (with the rhematic 2 position, as in (44)), the opposite is true of connectors used between the subject and the predicate (as in (45)), as is clear from the figures obtained for the rhematic 1 position. It remains that, when rhematic 1 and rhematic 2 connectors are taken together, the overall proportion of connectors used parenthetically is higher in French than in English (64% vs. 37.3%). In Chuquet and Paillard (1989), C0 refers to the grammatical subject of a sentence, while C1 refers to the object of a transitive verb. 20 “Le schéma canonique d’une phrase [est] défini comme la séquence: C0 – verbe – C1 […] Alors qu’il est fréquent de trouver en français différents éléments insérés entre le C0 et le verbe ou entre le verbe et le C1 sous forme d’incise, l’anglais au contraire évite en général de faire éclater ce bloc” (Chuquet and Paillard 1989: 155-156). (44) Deux faits divers dramatiques survenus en une journée, samedi 4 juin, relancent le débat sur le rééquilibrage nécessaire entre la route et les autres moyens de transport. Débat éternel et décourageant, car tout le monde est d’accord sur l’objectif. La route ne cesse pourtant de marquer des points par rapport au rail. (45) To save the government’s blushes, the committee has decided that new gambling laws are “necessary and urgent” and says that the government’s general framework is “about right”. No minister, though, should hide behind those words and pretend that the committee has given a good report on the bill. 6. Discursive effects of connector placement In the previous section, it was demonstrated that some of the placement preferences of English and French can be accounted for by means of syntactic factors such as the difference between verb-raising and non-verb-raising languages. But adverbial connector placement is also closely related to rhetoric and information structure. For Lenker (2011: 12), the initial position is the most “natural” position for connectors in view of their linking function. As a result, when these items are used in other positions, there has to be a “good reason” (cf. the so-called “good reason principle”). In these cases, the connector usually takes on further functions, pertaining to thematic and information structure, in addition to its regular connecting function. This suggests that cross-linguistic divergences in connector placement are not only syntactic, but may also provide some information about the ways English and French handle thematic and information structure. Interestingly, the two positions that are most apt to fulfil such rhetorical effects are rhematic 1 and rhematic 2, i.e. precisely the two positions that have been overlooked in SFL research. It is through being used as parentheticals that connectors participate in information structure (Taglicht 1984: 22-25). The position labelled rhematic 1 in the present study has already been discussed by Altenberg (1998, 2006) for English and Swedish, and Lenker (2011) for English. The discursive effects of rhematic 1 connectors uncovered in this study further support the analyses made by Altenberg and Lenker. As a reminder, rhematic 1 connectors are used after the topical Theme of the clause, whether marked (as in (46)) or unmarked (as in (47)). (46) When the surplus evaporated and turned into a huge deficit, however, Bush did not reverse his arguments. (47) A newspaper doesn’t charge buyers more when they throw away everything but the sports section. They might want to — and their advertisers might agree — but they don’t. Airlines, however, charge more for a one-way ticket because they know that some business travelers need the flexibility to buy such tickets, and are willing to pay more for it. Taglicht’s partitions are roughly equivalent to what has been referred to so far as parentheticals. ‘natural’ order of Themes, brings to the fore the personal stance of the writer, as in (48) and (49). (48) [A] more general political review of the coming year would be a far more fitting address at the beginning of the session, something much closer to the US President’s State of the Union speech. This, as President Clinton used to his advantage, provides the executive with an excellent platform to explain its ideas and announce initiatives. Clearly, however, it would be wholly inappropriate for the Queen to deliver such a speech. (49) Condamnation, vigilance, solidarité : la vigueur de la réaction présidentielle est salutaire. Il n’est pas certain cependant qu’elle suffise à apaiser le malaise des juifs de France. But in addition, when used in rhematic 1 position, the connector frequently highlights a topical shift in discourse: in the clauses or clause complexes related by the connector, the writer is moving from one topical Theme – or point of departure of the clause – to another, hence breaking the thematic continuity of the text (see Altenberg 2006: 19-20), as in (50a), where the focus of the message is moving from past premiers to Mr Blair. Marking off the topical Theme has the effect of guiding the reader through the discursive shifts by highlighting these shifts. Compare (50a) and (50b), where (50b) is a modified version of the original example (50a). Because of the rhematic 1 connector, the topical shift appears more clearly in (50a) than in (50b). time. On the other hand, Mr Blair has rewritten the handbook on prime ministerial accessibility and accountability. The data shows that the topical shifts may be circumstantial (in the case of marked Themes), as in (51) and (52), or involve participants (in the case of unmarked Themes), as in (53) and (54). In yet other cases, the connector is used after a viewpoint subjunct that specifies the domain of application of what is stated in the second clause, as opposed to the first: in (55), for example, the writer is contrasting the political and practical planes to the legal one. (51) Prior to 1992, most candidates’ TV spots — particularly those blasting an opponent — carried a disclaimer in type the size of the fine print on an insurance policy, which was on screen for a nanosecond. In December 1991, however, the Federal Communications Commission handed down a ruling that all political commercials must contain a readily readable sponsorship tagline clearly indicating who paid for the spot. (52) Le matin, devant les principaux chefs militaires français, il a confirmé la perspective d’une guerre avec l’Irak en demandant aux militaires de “se tenir prêts à toutes éventualités” […]. L’après-midi, en revanche, devant les représentants du corps diplomatique, il a réaffirmé que “l’éventuelle décision d’utiliser la force doit être explicite et être prise par le Conseil de sécurité des Nations unies sur la base d’un rapport motivé des inspecteurs”. (53) Andrew Marr, one instinctively senses, wisely judges he would carry less credibility in white. Mark Mardell, on the other hand, has white-suit cred written all over him. (54) Ensuite, le calendrier de Bush lui impose d’aller vite afin de se dégager de ce bourbier pour mener plus tranquillement sa campagne présidentielle. Enfin, la guérilla, au contraire, a tout intérêt à ce que le règlement traîne pour accroître sa terreur et sa force. (55) Secretary of Defense Donald Rumsfeld characterizes us as “liberators” for political and practical reasons. Legally, however, there has never been a question. Finally, fronting topical Themes by means of rhematic 1 connectors makes it possible to highlight very clearly the focus of the contrastive relation expressed by the connector, i.e. what exactly is opposed through the adverb (e.g. Past premiers vs. Mr Blair in (50); Prior to 1992 vs. In December 1991 in (51)). Most of the examples covered so far show very clearly the effect that rhematic 1 connectors perform at the level of information structure, as two very distinct topical Themes are explicitly stated in each of the clauses. However, the transition to the new topical Theme is not always signaled as clearly, as shown in examples (56) and (57). (56) By the time he had put Tam Dalyell in his place by pointing out that the Father of the House had confused Tony Blair’s chief of staff Jonathan Powell with his brother Sir Charles Powell, Mr Clarke’s reincarnation as cuddly old Ken was complete. The real Mr Clarke, however, is a very different and much more formidable politician. (57) L’année 2002 restera, aussi, celle où la machine Muray a, pour la première fois, connu quelques ratés. Son fonctionnement, pourtant, n’est nullement en cause; on peut même dire qu’il n’a jamais été aussi brillant. The results discussed in Section 5 revealed that rhematic 1 connectors are markedly more frequent in English than in French. It is therefore much less frequent in French than in English to signal a topical shift in discourse by means of connector placement. This may stem from the fact that French has a large variety of lexical and grammatical devices to perform a thematizing function similar to that conveyed by rhematic 1 connectors, among which syntactic dislocation, as in (58), and the prepositional phrase quant à, as in (59) (see Rivelin-Constantin 1992; Rossette 2007: 40). These devices are either not available or much less common in English. Thus, it may be that the more frequent use of rhematic 1 connectors in English compensates for the lack of such resources. (58) La Roumanie et la Bulgarie devront encore patienter. La Turquie, elle, est pressée d’ouvrir les négociations d’adhésion et elle le manifeste sans trop d’habileté. (59) Georges-Marc Benamou ronchonne que si c’est Ben Laden qui fait élire les majorités, la vieille Europe est mal barrée. Quant à Alexandre Adler, il fait carrément la gueule en évoquant un vote “munichois”. As is usually the case in qualitative studies, the above analysis sets out general tendencies instead of absolute rules. Even though a majority of rhematic 1 connectors fit the pattern described above in terms of information structure, a limited number of these connectors appeared to produce other effects. For example, I also found a number of cases in which the marked off topical Theme was a cohesive resumption, by means of either lexical cohesion or reference,22 of information described in the previous sentence. This is the case in example (60), where that calculation is a resumption of the entire preceding sentence. In yet other cases, the fronted element was the last and culminating item of an enumerated list, as in (61). It is, however, beyond the purpose of the present study to draw up an inventory of all the possible effects produced by rhematic 1 connectors. be given immediate access to them. The greatest failure, however, is the old Russian nemesis: the failure to be honest. As Lenker (2011: 15) explains, “it is not the adverbial [connector] itself which is focused through different medial positions, but other constituents in the sentence”. We just saw that rhematic 1 connectors have the effect of laying emphasis on the Theme of the clause. Rhematic 2 adverbs, on the other hand, draw attention to the Rheme of the clause, or to part of it, as demonstrated in Lenker (2011). As partitions, adverbial connectors placed within the verb phrase are one of the three ways of creating a socalled marked Rheme, i.e. a Rheme that is detached from the other elements of the sentence (Taglicht 1984: 20). As Taglicht (1984: 25) explains, marked Rhemes “involve an element of delay”: the reader is kept waiting for the end of the clause. By delaying (part of) the Rheme, and by marking it off from the rest of the sentence, rhematic 2 connectors give it more attention than it would have received in the unmarked sequence, hence their focusing function. Compare (62a) and (62b) below, where (62b) is a modified version of the original example. Through occurring after a typographical break, the Rheme in (62a) is marked off, thus receiving special focus. This is not the case in (62b), where the Rheme is fully integrated into the clause. (62) (a) Obviously such an eradication could not be accomplished quickly, especially because the vaccine offers only shortterm protection. Congress and the Bush administration could, however, take smaller steps. (b) Obviously such an eradication could not be accomplished quickly, especially because the vaccine offers only shortterm protection. However, Congress and the Bush administration could take smaller steps. Another effect of rhematic 2 connectors pertains to the notions of given and new information. In SFL, each sentence can be described not only in terms of its thematic structure (Theme and Rheme), but also in terms of its information structure, organized into given and new information. Each clause or clause complex typically contains both given information (i.e. information that is presented as known or recoverable by the listener or reader) and new information. While distinct, information structure and thematic structure are closely related: in unmarked clauses, the given information coincides with the Theme, and the new information coincides with the Rheme (Halliday and Matthiessen 2004: 89). Note that auxiliaries, as semantically empty function words, are not considered to contribute new information to the clause. The same is true of copular verbs (see Lenker 2011: 17). Instead, the lexical verb and the complements are the major repositories of new information. In view of this, the rhematic 2 connectors in the corpus can be said to act as “partitioners of given and new information” (Lenker 2011: 17), signalling explicitly the transition between what the reader knows and the genuine informational contribution of the clause to the text, as in (63) and (64). These observations are in keeping with those made by Lenker (2011). (63) President Bush would, though, be content to let regional powers contain and constrain the North Korean leadership if they were willing to do so. (64) Malgré ces succès, l’Inde n’a cependant pas atteint l’objectif annoncé dans la constitution de 1950.
discourse than it is to the organization of English discourse. On the other hand, as discussed in the previous section, at least some of this difference stems from a syntactic divergence between English and French as regards verb raising. This section has advanced that, alongside syntactic differences between English and French, divergent placement patterns may reflect differences at a more rhetorical level. At this stage, however, it remains difficult to determine the respective parts played by syntactic differences on the one hand, and rhetorical factors on the other. In any case, the rhetorical potential of connector placement covered in this section may explain why, in spite of the differences in overall word order flexibility that exist between English and French, no significant difference in flexibility was uncovered at the specific level of adverbial connectors. As Lenker (2011: 1) puts forward, as adverbials are the only sentence constituents that remain mobile in present-day English, the mobility of adverbial connectors in English serves precisely to make up for an otherwise very rigid ‘subject-verb-object’ structure. The raw frequencies are provided in Appendices 3 and 4. The occurrences of il n’en reste pas moins que, il n’en demeure pas moins que, il n’en est pas moins que were disregarded in the present analysis. These sequences function as extended cohesive units of contrast and will be investigated at a later stage of our work, together with a set of other non-adverbial sequences such as il reste que or it remains that. of adverbial connectors varies from one item to another. This calls into question the relevance of formulating general rules of placement for a language as a whole, as is usually the case in grammars and textbooks. These findings corroborate Hoey’s (2005) theory of lexical priming, which postulates that each word has a series of specific features in terms of collocation, colligation, semantic preference, register and stylistic features, but also positioning. They also support Sinclair’s (1991) view of language, which posits the inseparability of lexis and grammar. The results obtained for the connector though in Table 5 are particularly intriguing. Firstly, it was quite surprising to find such a high frequency of this connector in a corpus of formal writing, as this adverb is usually associated with informality (see Quirk et al. 1985: 632). In addition, it was expected that though used as an adverb would be found mostly, if not exclusively, in final position (ibid. 643). The corpus data shows that only a small proportion of the occurrences of though (6.9%) occurred in rhematic 3 position. Instead, the large majority of occurrences of though were found in rhematic 1 position (75.9%), as in (65). (65) If the cuts are made permanent, as Mr. Bush wants, the cost would be $780 billion. Taxpayers, though, aren’t going to tolerate -- nor should they -- being swept into an alternate tax universe that hits them with big, unanticipated bills. unexpected mobility of though in the corpus may occur as a means to produce effects that this connector would not need to produce in speech, as they would be ensured by other elements. Compare, for example, (66a) and (66b), where (66a) is the original written version of the example found in the corpus, and (66b) is a modified version of (66a), where small caps represent the stressed element. In (66b), the contrast between the Conservatives, on the one hand, and Mr Hoon, on the other, is already ensured by stress, thus making the use of though in rhematic 1 position somewhat redundant. In addition, it may in fact be the case that the prevalence of the initial (or thematic 1) position, while not supported by the evidence obtained from a written corpus, is attested in speech, as this mode has a fairly limited use for connectors in medial positions (i.e. rhematic 1 and 2). This hypothesis is in line with Biber et al.’s (1999: 891) findings, which reveal a considerable difference in percentage of medial connectors between academic writing (c. 40%) and conversation (less than 2.5%). (66) (a) The Conservatives agree. Mr Hoon, though, sees things differently. (b) The Conservatives agree. MR HOON sees things differently, though. Throughout this study, three main factors have been demonstrated to affect connector placement: language-specific syntactic, rhetorical and lexical factors. These three aspects may seem hard to reconcile, and it is undoubtedly challenging to assess the part played by each of them. For example, there might seem to be a tension between the lexical component and the rhetorical effects achieved by connector positioning. However, for instance, occurs predominantly in rhematic 1 position, while plutôt is usually placed in rhematic 2 position and even so occurs almost exclusively in thematic 1 position. The question arises of whether these profiles are predominantly defined by the intrinsic lexical features of each item, or by their rhetorical functions in discourse. One way of resolving the tension between those two factors would be to postulate a correlation between a given connector and the creation of a specific rhetorical effect. This means that however would be closely associated with the explicit signalling of a topical shift; plutôt would often combine its connective function with a role of partitioner of information structure; and even so would typically perform a strictly connective function. Further research is needed to disentangle the respective contribution of each factor. thematic structure, such as the type of thematic progression or the presence of a marked Theme, may also influence connector placement. The extent of the role of these elements should be investigated in future studies. In addition, the role of the lexical factor has merely been touched upon here and would deserve further attention in a future study. In the context of such lexical analyses, it might be valuable to refine the notion of contrast, providing a fine-grained semantic analysis of the meaning aspects of each adverb. The notion of adverbial scope might also be worth investigating in future research. It should be borne in mind that the results reported in the present article only pertain to adverbial connectors of contrast, investigated in one register only. They might have been significantly different if another semantic relation had been investigated. It would also be extremely fruitful to investigate the placement patterns of these adverbs in various written registers, especially as it is now well-established that register variation can have an effect on cross-linguistic differences (see Lefer and Vogeleer 2014). In future research, I intend to examine whether both the placement patterns of each language and the differences between them are fairly stable across registers or whether they are significantly affected by register variation. I also plan to investigate connector placement in translation, as positional changes from the source texts to the target texts may provide valuable information on differences between the two languages, as well as on the individual positional profiles of the connectors. References Altenberg, Bengt. 1998. Connectors and sentence openings in English and Swedish. In Corpora and Cross-linguistic Research: Theory, Method and Case Studies, Stig Johansson and Signe Oksefjell (eds.). Amsterdam and Atlanta: Rodopi, 115-143.
la langue française, David Banks, Simon Eason and Janet Ormrod (eds.). Paris: L’Harmattan, 41-65. De Cesare, Anna-Maria. 2010. On the focusing function of focusing adverbs: A discussion based on Italian data. Linguistik Online 44(4): 99-116. Dehé, Nicole and Yordanka Kavalova. 2007. Parentheticals. An introduction. In Parentheticals, Nicole Dehé and Yordanka Kavalova (eds.). Amsterdam and Philadelphia: John Benjamins, 1-22. Downing, Angela. 1991. An alternative approach to theme: A systemic-functional perspective. Word 42(2): 119-143. Dupont, Maïté. 2013. Contrastive relations in English and French editorials. MA dissertation, Université catholique de Louvain. Dyvik, Helge. 1998. A translational basis for semantics. In Corpora and Crosslinguistic Research: Theory, Method and Case Studies, Stig Johansson and Signe Oksefjell (eds.). Amsterdam and Atlanta: Rodopi, 51-86. Fries, Peter H. 1994. On Theme, Rheme and discourse goals. In Advances in Written Text Analysis, Malcolm Coulthard (ed.). London: Routledge, 229-249. Fries, Peter H. 2002. The flow of information in written English text. In Relations and Functions within and around Language, Peter H. Fries, Michael Cummings, David Lockwood and William Spruiell (eds.). London: Continuum, 117-155. Green, Christopher F., Elsie R. Christopher and Jacquelin Lam Kam Mei. 2000. The incidence and effect on coherence of marked themes in interlanguage texts: A corpus-based enquiry. English for Specific Purposes 19: 99-113. Greenbaum, Sidney. 1969. Studies in English Adverbial Usage. London: Longman. Grevisse, Maurice and André Goosse. 2011. Le bon usage: Grammaire française. Bruxelles: De Boeck-Duculot. Gries, Stefan Th. and Sandra Deshors. 2014. Using regressions to explore deviations between corpus data and a standard/target: Two suggestions. Corpora 9(1): 109136. Grieve, James. 1996. Dictionary of Contemporary French Connectors. London: Routledge. Halliday, M.A.K. 2006. Afterwords. In System and Corpus. Exploring Connections, Geoff Thompson and Susan Hunston (eds.). London: Equinox, 293-299. Halliday, M.A.K. and Ruqaiya Hasan. 1976. Cohesion in English. London: Longman. Halliday, M.A.K. and Christian M.I.M Matthiessen. 2004. An Introduction to Functional Grammar. London: Hodder Arnold. Hannay, Mike and María de los Ángeles Gómez González. 2013. Thematic parentheticals in Dutch and English. In Contrastive Discourse Analysis. Functional and Corpus Perspectives, Maite Taboada, Susana Doval Suárez and Elsa González Álvarez (eds.). London: Equinox, 94-122. Hasselgård, Hilde. 1996. Where and When: Positional and Functional Conventions for Sequences of Time and Space Adverbials in Present-day English. Acta Humaniora 4, University of Oslo, Faculty of Arts. Oslo: Scandinavian University Press. Hasselgård, Hilde. 2004. The role of multiple themes in cohesion. In Discourse Patterns in Spoken and Written Corpora, Karin Aijmer and Anna-Brita Stenström (eds.). Amsterdam and Philadelphia: John Benjamins, 65-87. Hasselgård, Hilde. 2010. Adjunct Adverbials in English. Cambridge: Cambridge University Press. Hoey, Michael. 2005. Lexical Priming. A New Theory of Words and Language. London and New York: Routledge. Jacobson, Sven. 1964. Adverbial Positions in English. Stockholm: Studentbok. Knott, Alistair. 1996. A data-driven methodology for motivating a set of coherence relations. 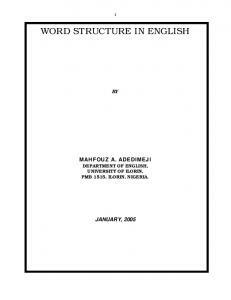 PhD dissertation, University of Edinburgh. Kunz, Kerstin and Erich Steiner. 2013. Towards a comparison of cohesive reference in English and German: System and text. In Contrastive Discourse Analysis. 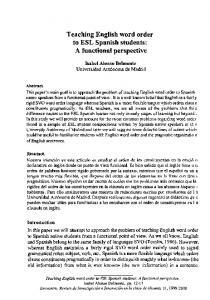 Functional and Corpus Perspectives, Maite Taboada, Susana Doval Suárez and Elsa González Álvarez (eds.). London: Equinox, 208-239. Le Draoulec, Anne and Myriam Bras. 2006. Quelques candidats au statut de “connecteur temporel”. Cahiers de grammaire 30: 219-237. Lefer, Marie-Aude and Svetlana Vogeleer (eds.). 2014. Genre- and Register-related Discourse Features in Contrast. 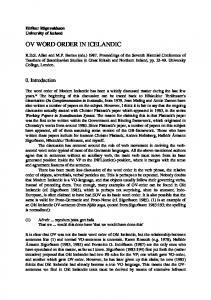 Special issue of Languages in Contrast 14(1). Lenker, Ursula. 2010. Argument and Rhetoric. Adverbial Connectors in the History of English. Berlin and New York: Mouton de Gruyter. Lenker, Ursula. 2011. A focus on adverbial connectors: Connecting, partitioning and focusing attention in the history of English. In Connectives in Synchrony and Diachrony in European Languages, Anneli Meurmann-Solin and Ursula Lenker (eds.). Eurospeech’2003, vol. 5: 2035-2039. Budapest. Scott, Mike. 2012. WordSmith Tools 6. Liverpool: Lexical Analysis Software. Sinclair, John M. 1991. Corpus, Concordance, Collocation. Oxford: Oxford University Press. Taglicht, Josef. 1984. Message and Emphasis. On Focus and Scope in English. London: Longman. Thompson, Geoff. 2014. Introducing Functional Grammar. London and New York: Routledge. Thompson, Geoff and Susan Hunston (eds.). 2006. System and Corpus: Exploring Connections. London: Equinox. Trévise, Anne. 1986. Is it transferable, topicalization? 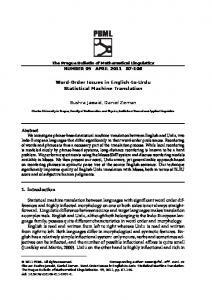 In Crosslinguistic Influence in Second Language Acquisition, Eric Kellerman and Michael Sharwood Smith (eds.). New York: Pargamon, 186-206. Vinay, Jean-Paul and Jean Darbelnet. 1995 . Comparative Stylistics of French and English. A Methodology for Translation. Amsterdam and Philadelphia: John Benjamins. Virtanen, Tuija. 1992. Discourse Functions of Adverbial Placement in English. Åbo: Åbo Akademi University Press. Report "1 Word order in English and French The position of ..."